Clear the site of debris, large stones and weeds. If persistent weeds are present you may wish to spray with a glyphosate weed killer such as Roundup. For soft weeds, you could use a paraquat based weedkiller such as Weedol. NB: Spray chemical treatments are not essential - good results are achievable without. 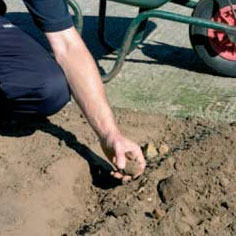 When the soil is dry, dig over or rotavate the site, correcting any high or low spots using Blended Premium Topsoil to give your turf the best possible start. Roughly set out shape and contours. 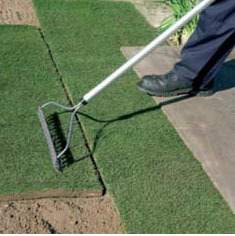 Firm the area using your feet or a garden roller. It will be firm enough when you leave a light impression of your footprint, without sinking. 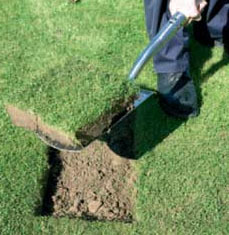 Level and grade the soil to the exact shape and contours required, getting the surface as smooth as possible. 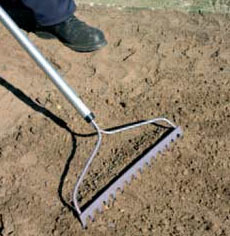 Rake to a fine tilth to a depth of about three quarters of an inch (20mm). As an option at this stage you can incorporate a general purpose fertilizer such as Growmore and rake into the surface if the soil is of low fertility. Ensure all preparation is completed prior to the turf arriving on site. Bring turf to site. Avoid walking on the prepared site. After the first row of turf has been laid, work from planks to minimise walking on the newly laid lawn. Start at the longest straight edge of your site. Lay turf end to end, butting up as closely as possible. Lay turf brick fashion by staggering the joints and rake again just before laying. Avoid stretching the turf. 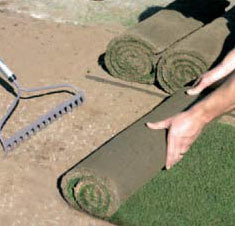 Firm the turf down using a light roller and water immediately. 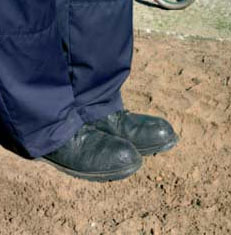 Ensure water soaks through to the underlying soil. Keep watered until fully established. (See tips on Coping with Drought). When mowing, box all clippings. Never remove more than 25% of growth at any one mowing. 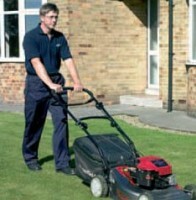 The first mowing should take place when over three quarters of an inch (20mm) of new growth has appeared. Only remove this new growth at the first cut, and only gradually reduce mowing height if a close cut is required. For more useful tips, read our month-to-month guide on taking care of your lawn. There may be foreign bodies in turf, please use gloves.